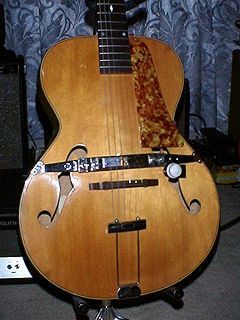 The model S-59 Spanish Guitar was introduced in 1940 and deleted after the war. 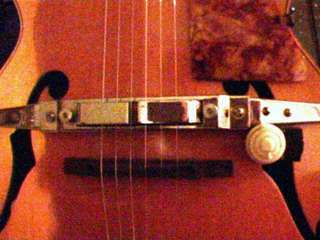 This guitar was an acoustic/electric with a detachable version of the horseshoe pickup created and patented by Paul Barth. 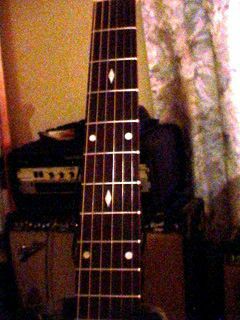 (Electro String sold the pickup separatly as an accessory.) 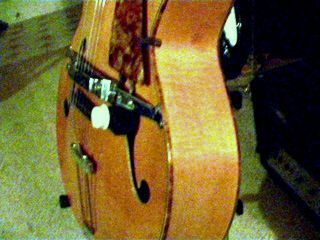 The 1941 Grossman Music catalog had this description of the S-59: " A new Blonde, arch-top and back, Super Auditorium size, having shell bound edges, ovalled, rosewood fingerboard, with pearl inlay position markings, adjustable bridge, and celluloid guardplate. 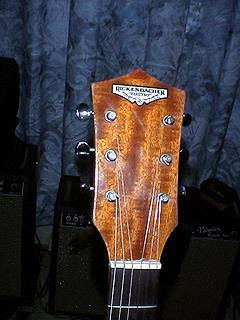 Has good quality, deep tone alone without amplification." This was patented on 9 Feb 1943 (Patent #2310606) and the application was made on 25 October 1941 (Application #416,532). Work on this pickup, by Paul Barth incidentally, didn't begin until sometime in 1940.